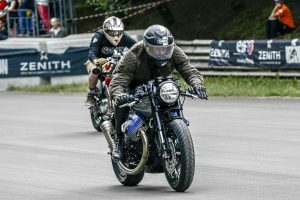 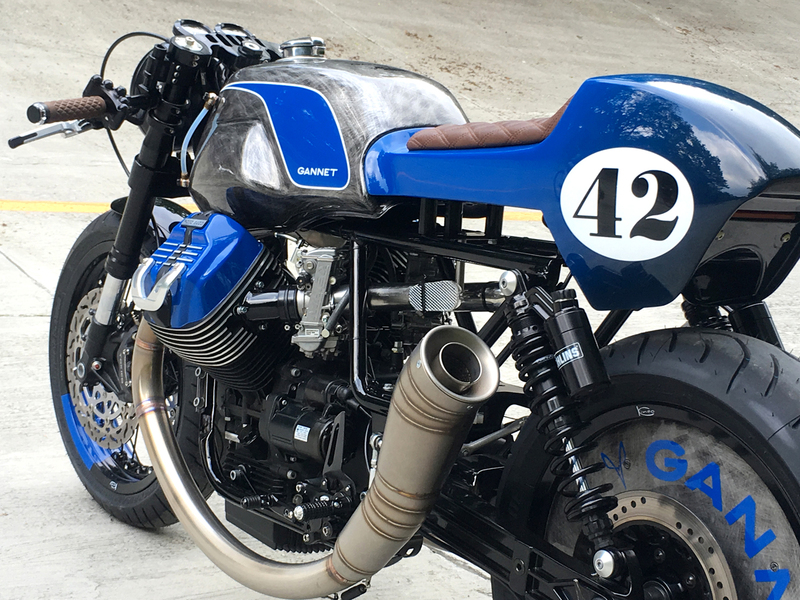 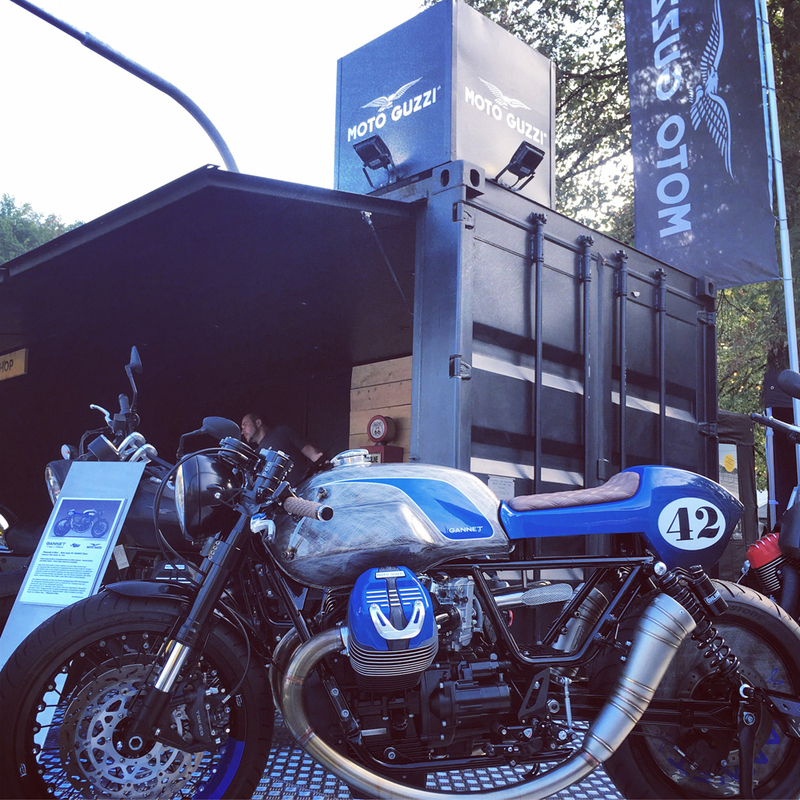 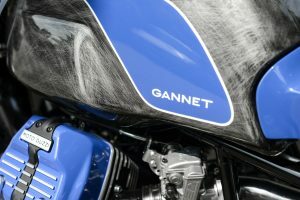 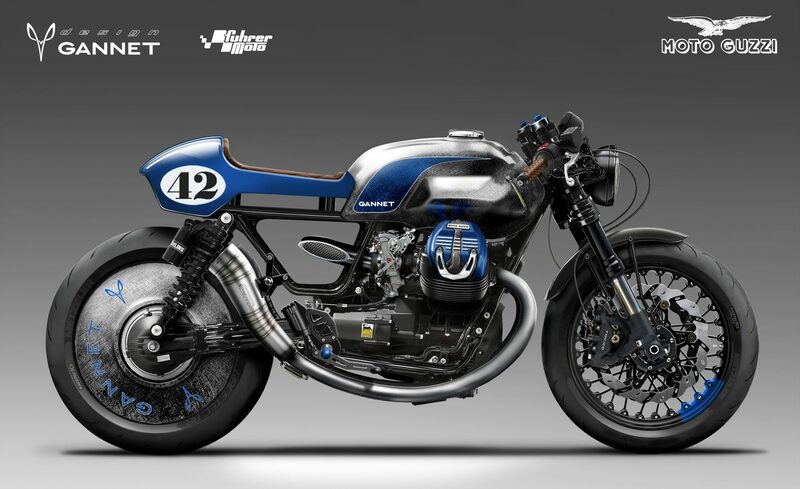 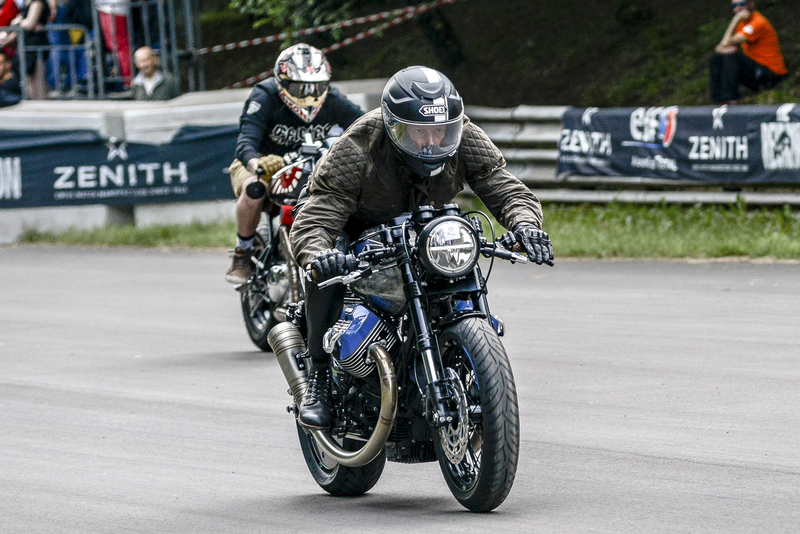 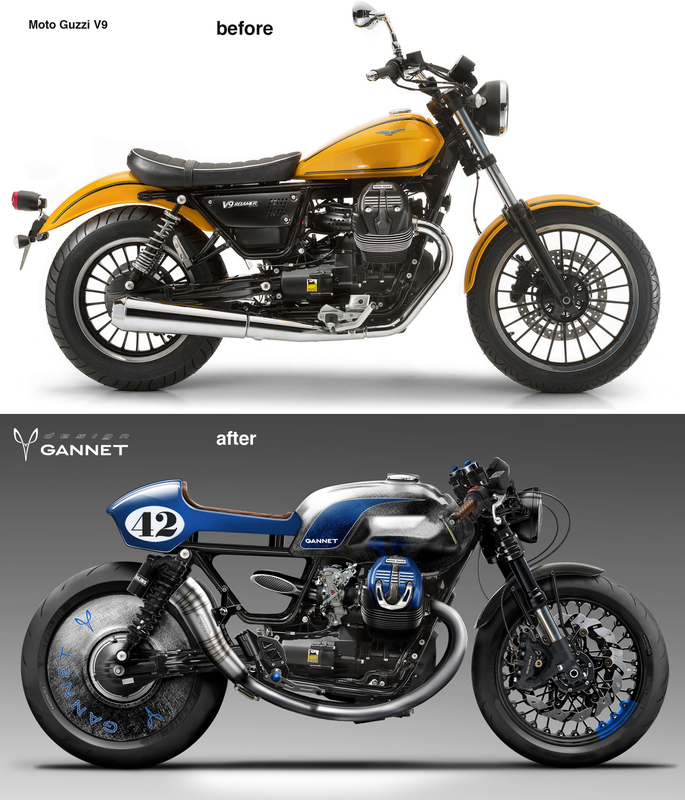 Moto Guzzi V9 GANNET Racer – Displacement: 853 cc Model: V9 – 2016. 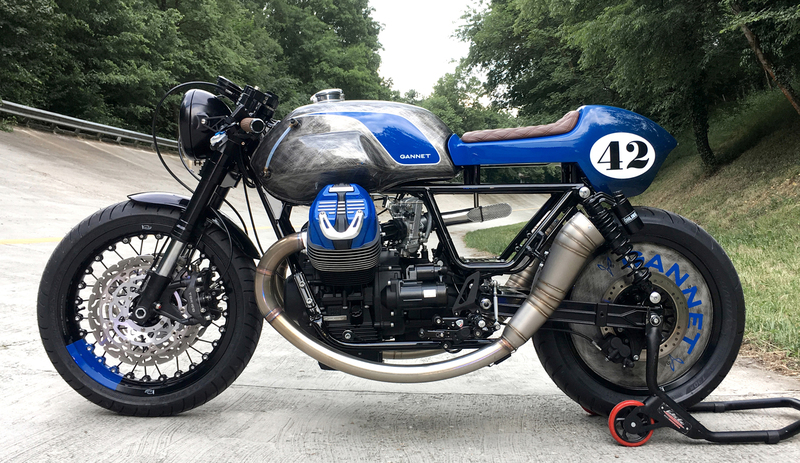 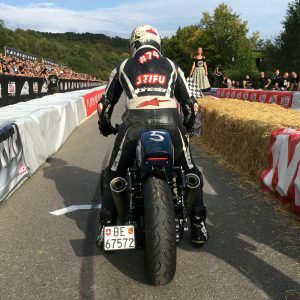 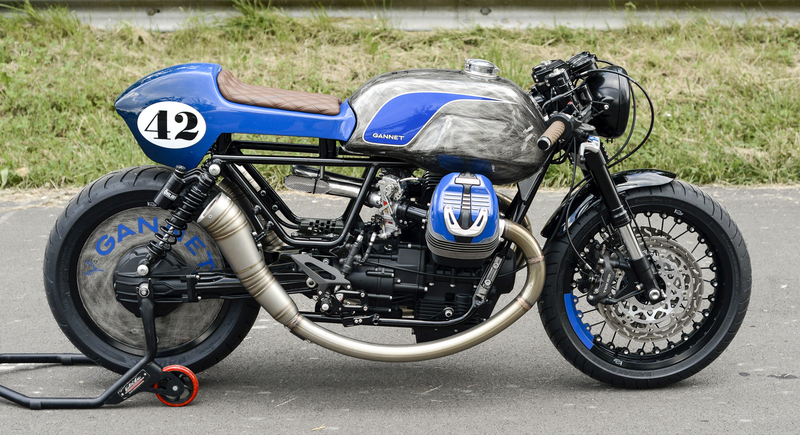 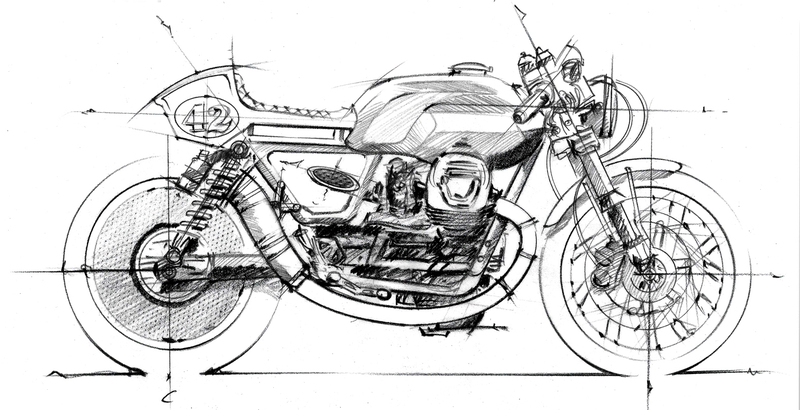 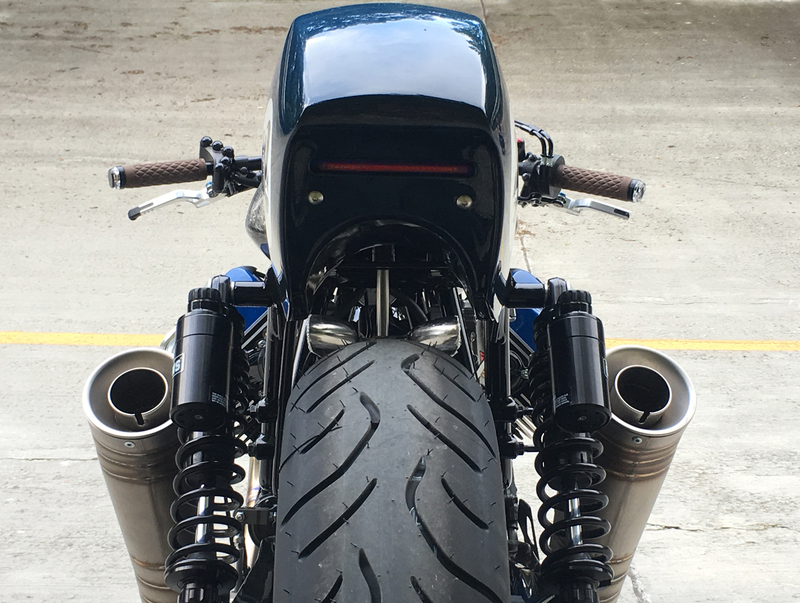 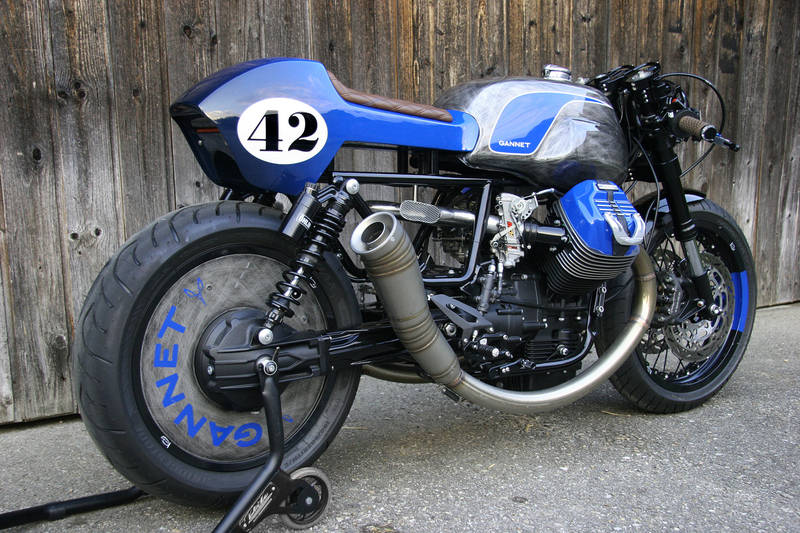 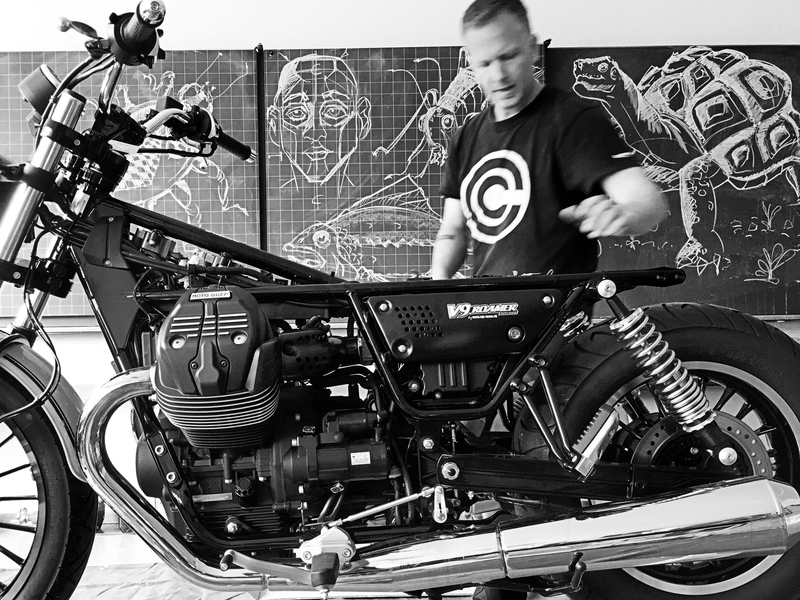 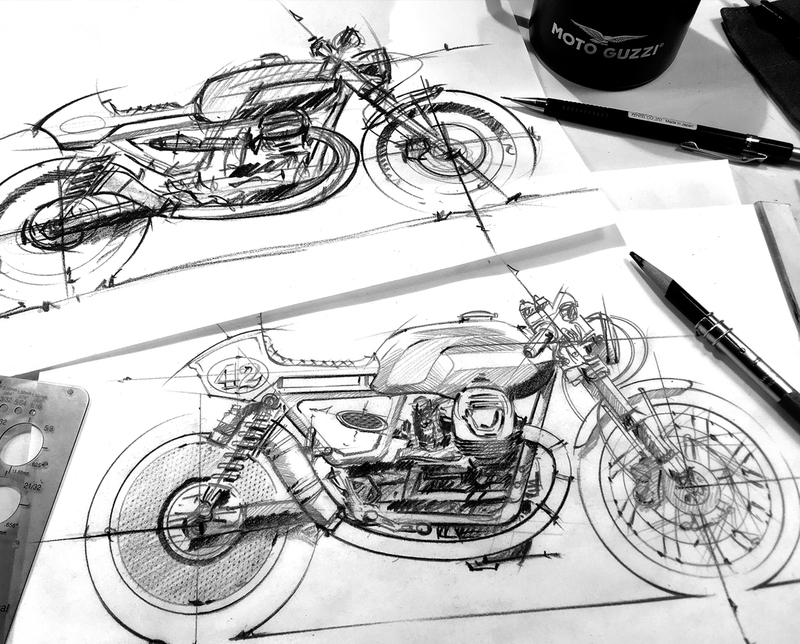 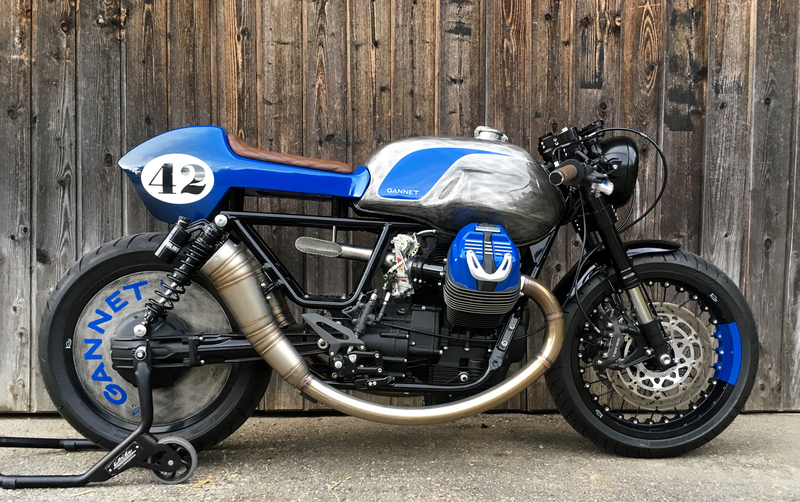 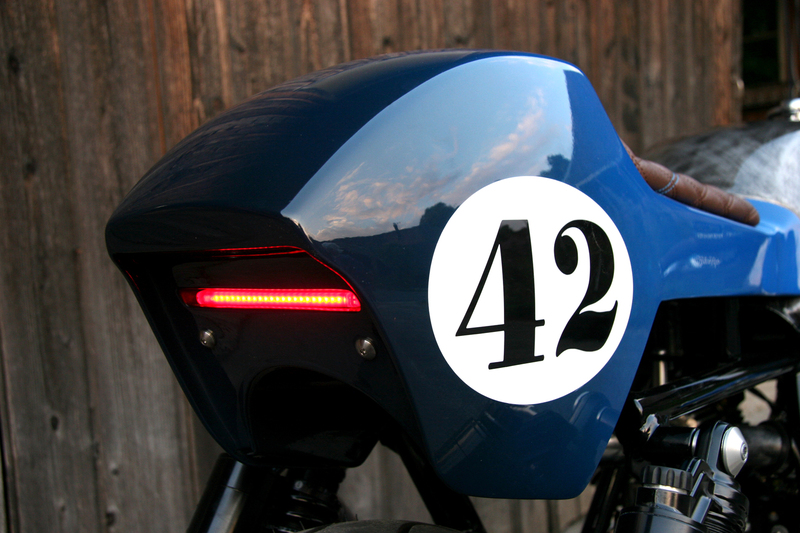 Custom conversion of a Moto Guzzi V9 into a pure Cafe Racer. 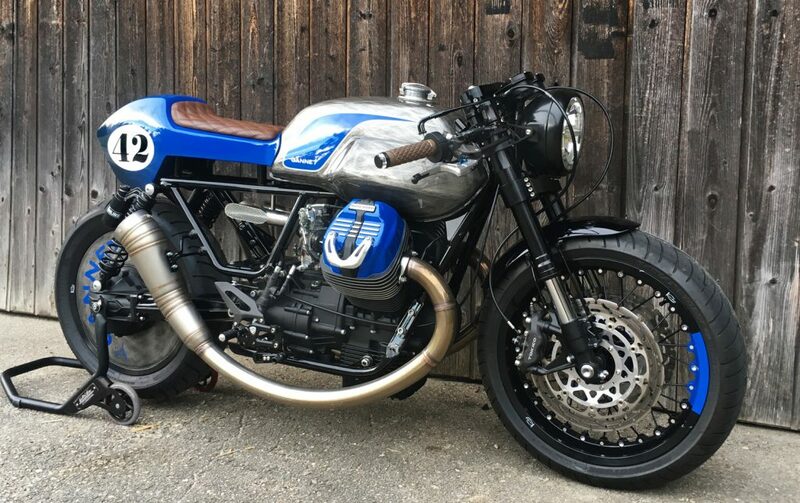 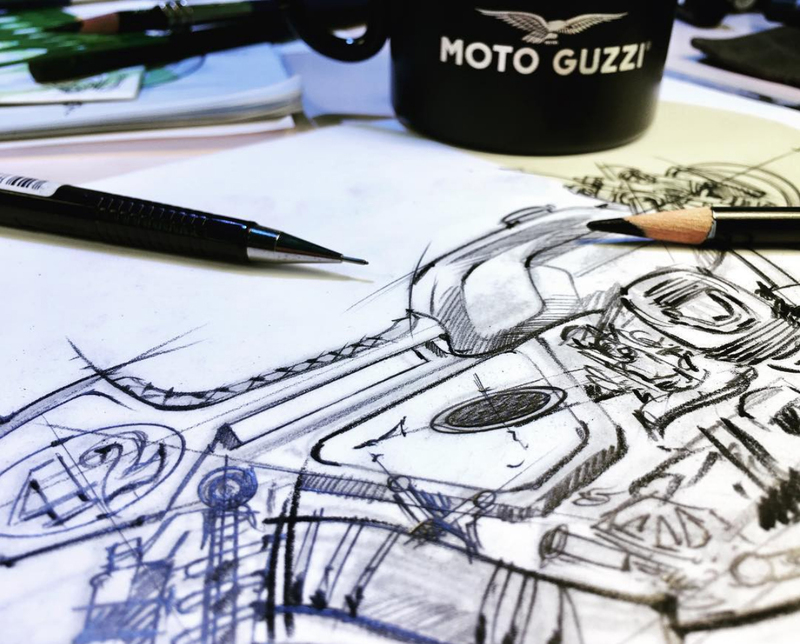 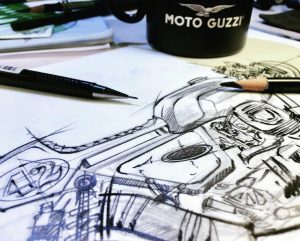 A reduced bike with classic design elements on a modern V9 base, the Moto Guzzi was transformed into a timeless and purist racer. 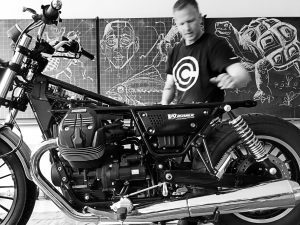 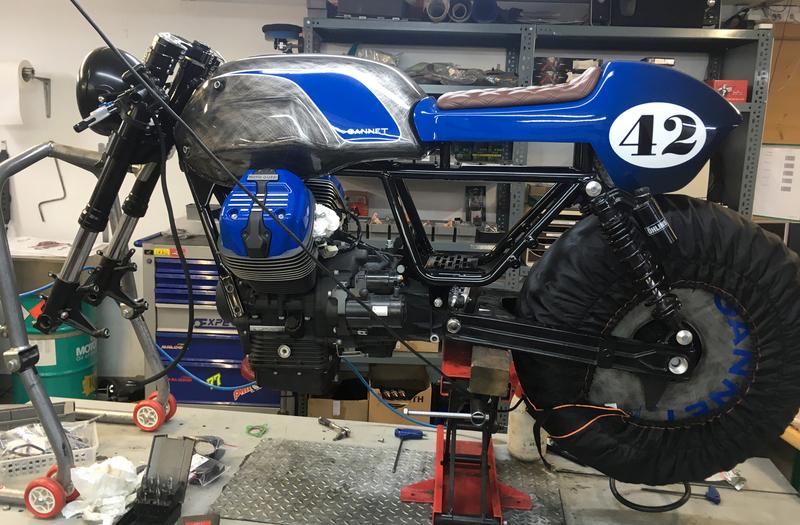 Although the motorbike is from 2016, we went “back to the roots” and provided it with artificial respiration with the help of two Keihin carburetors. These will give the bike the necessary boost for the sprint races and give the conversion a flair of nostalgia. 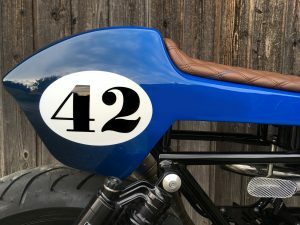 Finest artisan work with hand made tail section out of aluminum and partially adapted frame construction gives this conversion a pure racer look. 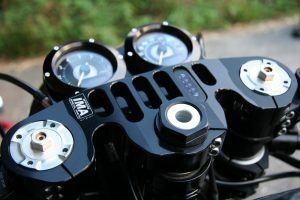 To top up the racing configuration, the bike is seasoned with the finest herbs from racing components such as CNC Racing footpegs, Jetprime racing buttons and IMA triple clamp, as well as various custom-made elements. 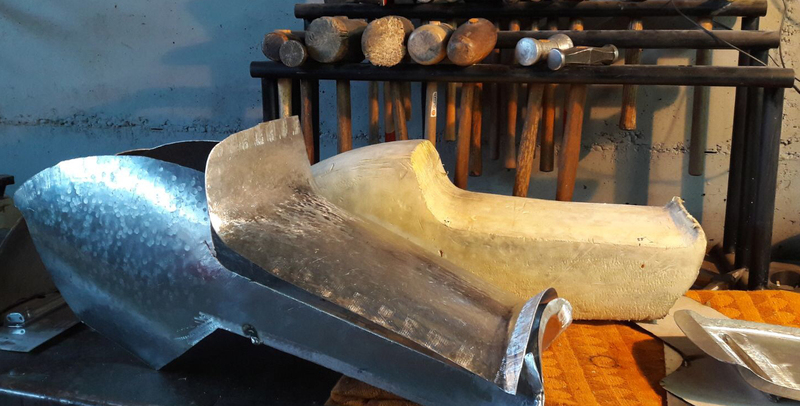 The project started with some loose sketches to find the good way for morphing the Roamer proportions into a forward leaning racer look.The entire tail section is out of aluminum and it is shaped and hammered purely by hand. 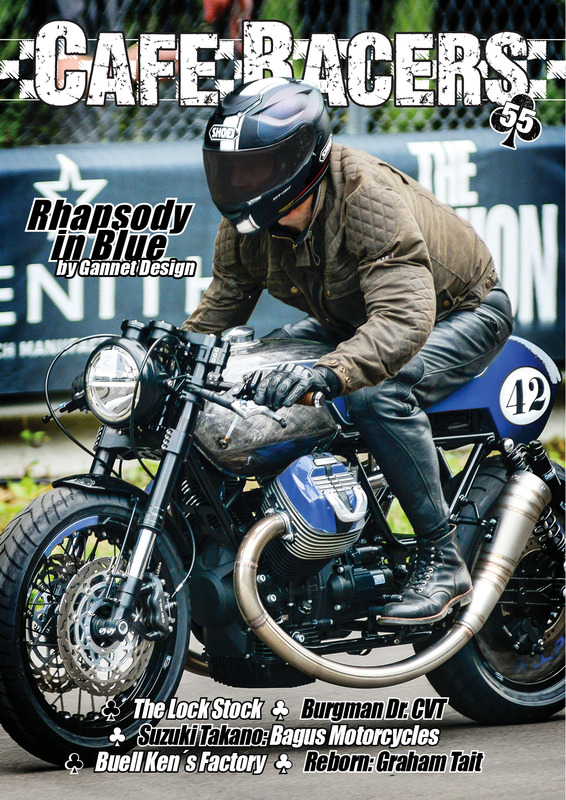 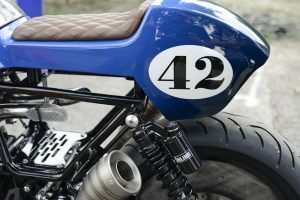 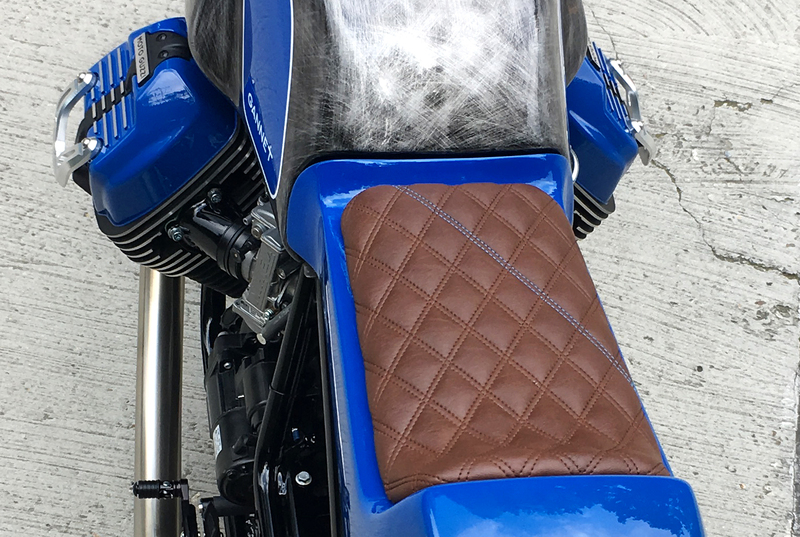 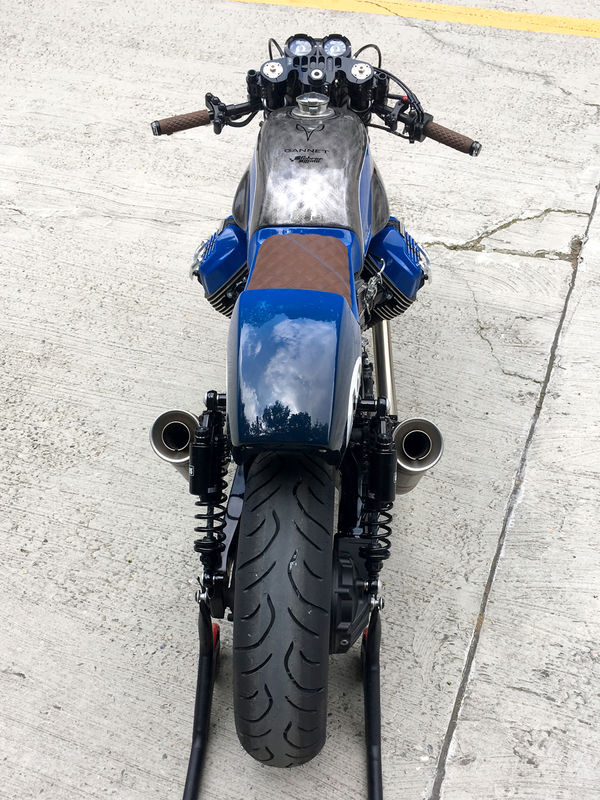 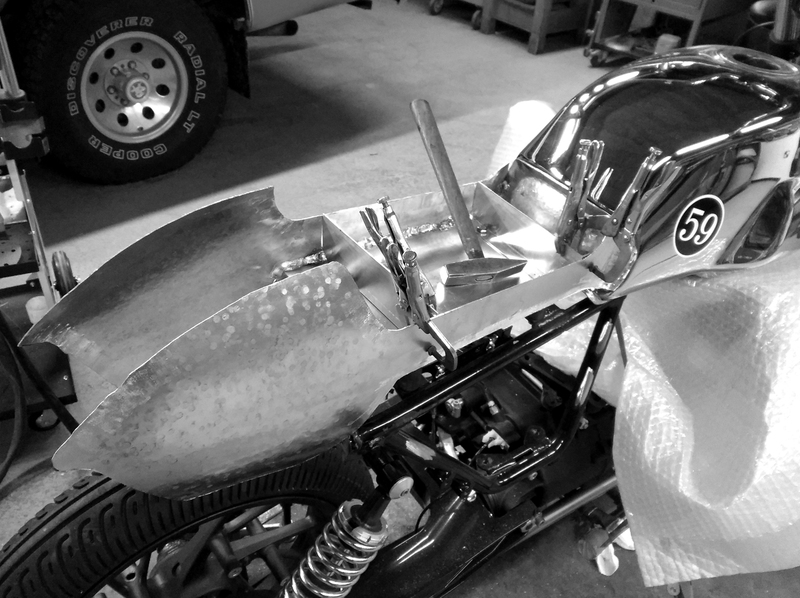 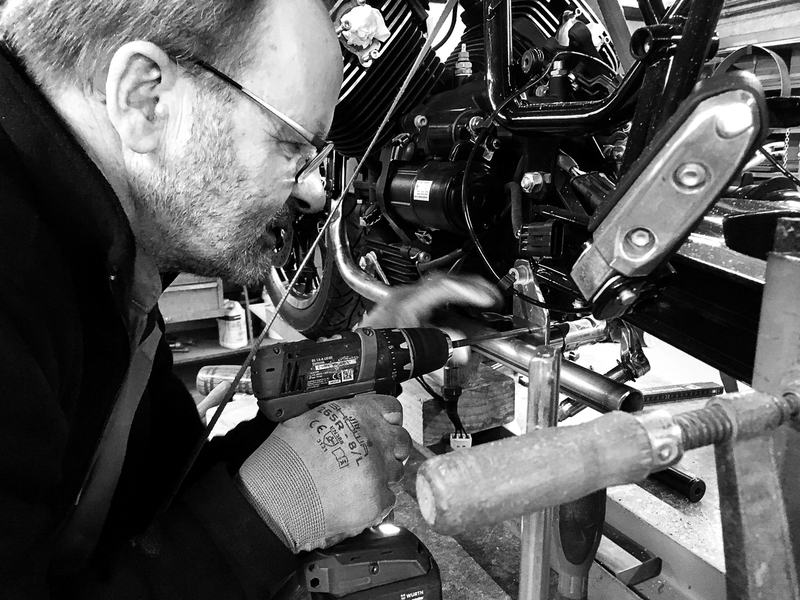 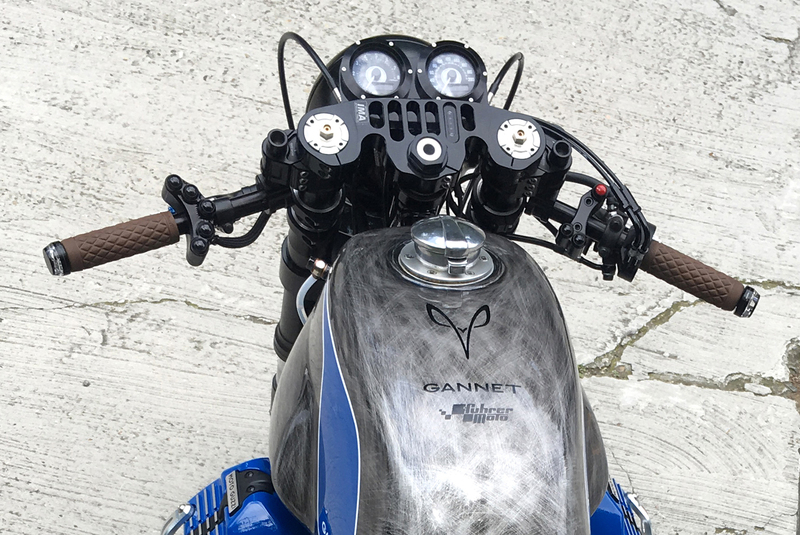 A new rear sub-frame supports the seat and cowl in the elevated position for a more racing height seat configuration and fitted with a thin brown kilted seat which matches the Biltwell grips on the handle bar. 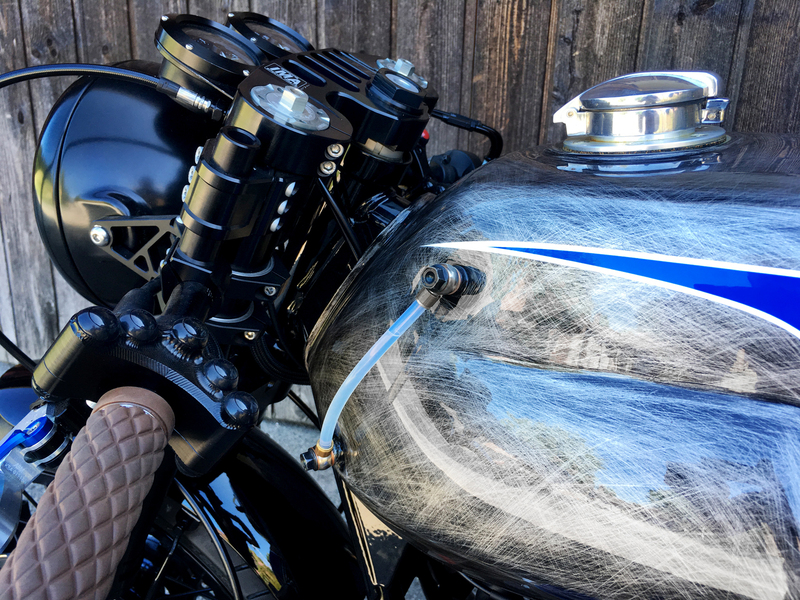 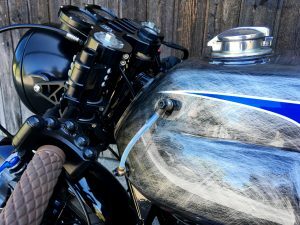 The paint work is a rare mixture of “scrubbed” and high gloss shine with a thick layer of clear coat, which blurs the perception and gives the rugged and scruffy design a very smooth appearance. The tail section and details are painted in a soft gradation of blue and the cylinder heads were also given the same touch of blue in combination with an aluminum protection bracket – Rhapsody in Blue.The lower part of the main frame was newly made, cleaned up and adapted with the new racer ergonomics position of the footrest by CNC Racing (Pramac MotoGP racing supplier). 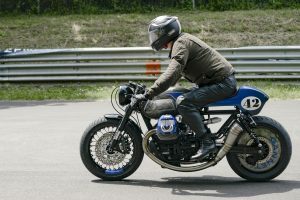 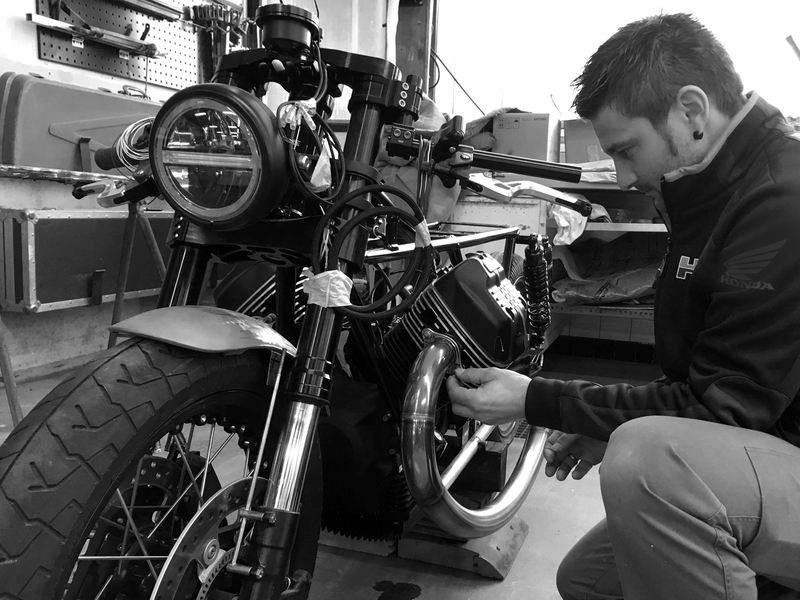 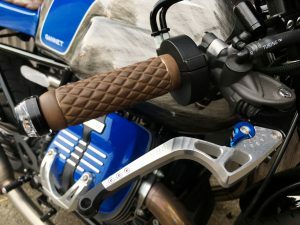 The gear shifter got modified and adapted to fit the Moto Guzzi gearing setup.The front fender got shortened and equipped with a new anchoring to fit the Öhlins forks. A new racing triple clamp by IMA with a custom made steering stem to fit the V9. For the clip-on’s we got sponsored by ABM Fahrzeugtechnik who equipped us with their multi clip and some fine Synto Evo brake/clutch levers in silver/blue/black to fit the color scheme of the bike.The all black racing control buttons from Jetprime give a menacing detail and a reference to the fast forward theme. 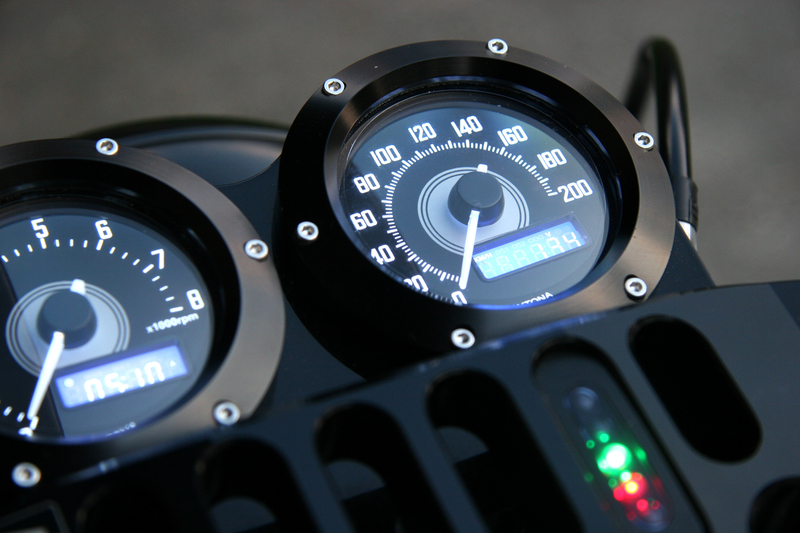 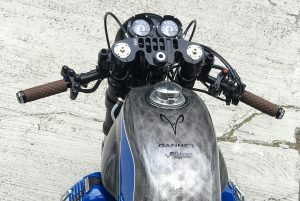 For the lighting system we got sponsored by Highsider and the speed gauges are by Daytona (Paaschburg&Wunderlich) which were fitted into a custom made bracket. 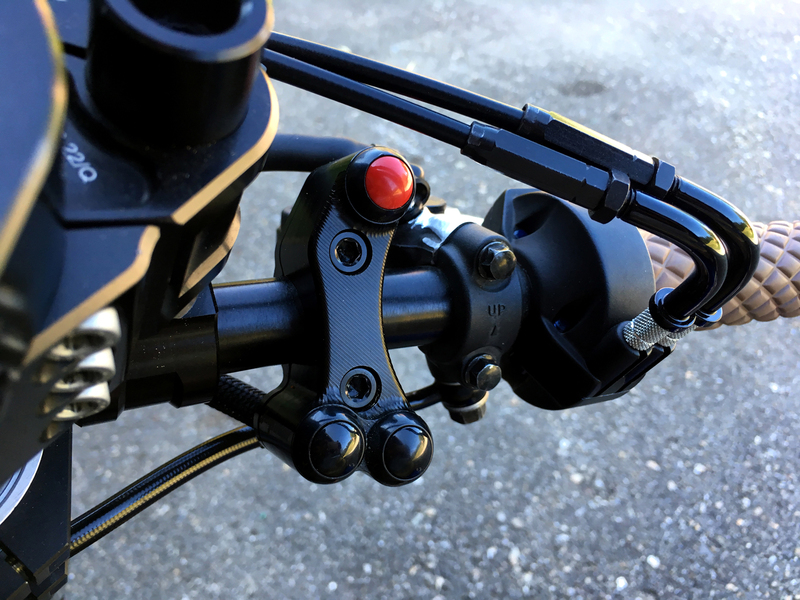 Electrical components are by motogadget, such as m-lock for keyless starting, bar end blinkers, m-blaze and m-unit for the control box.The 18″ front spoke wheel is specially made by Kineo to fit the new fork distance of 210mm. 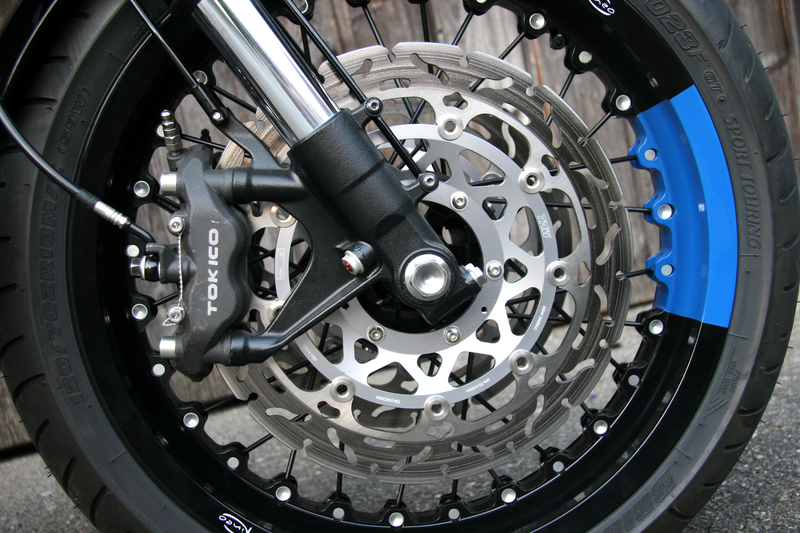 The rear is also a 18″ Kineo spoke wheel which got special aluminum cover plates. 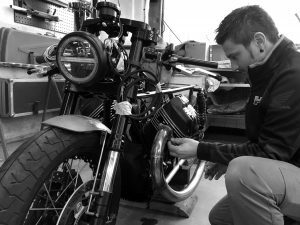 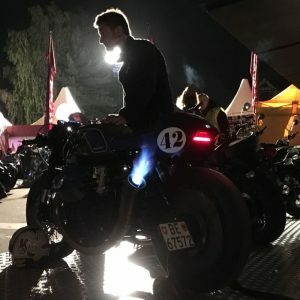 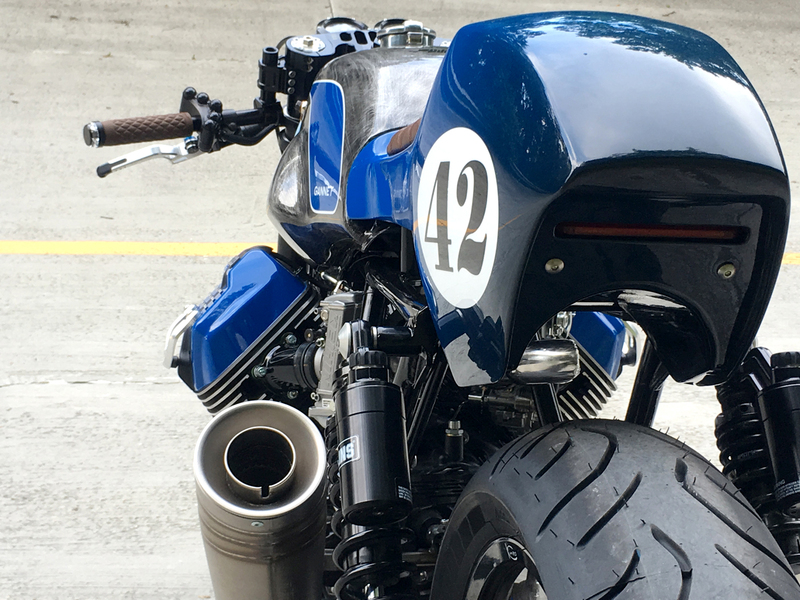 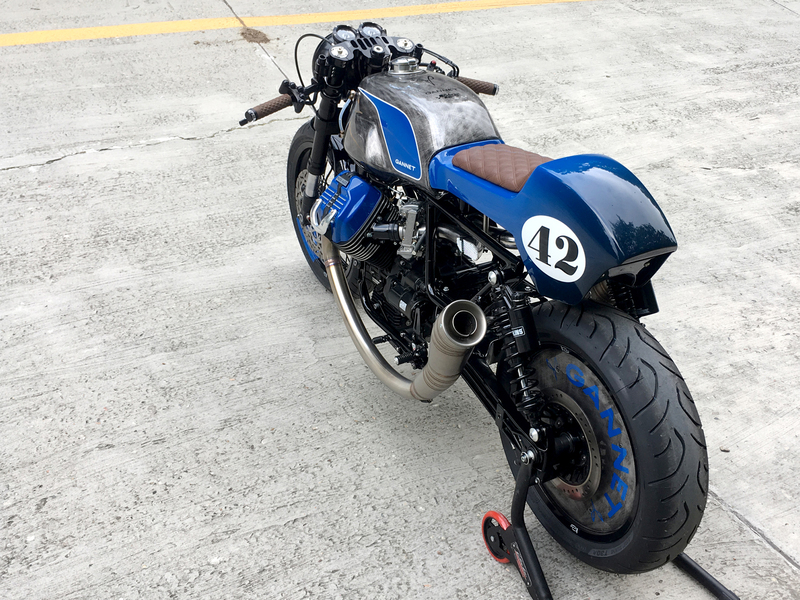 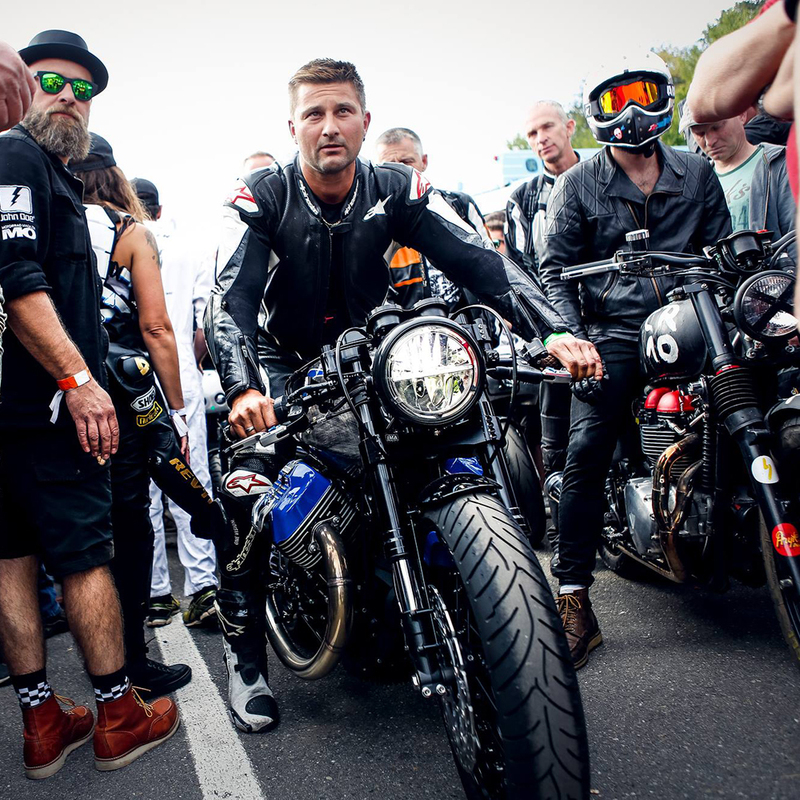 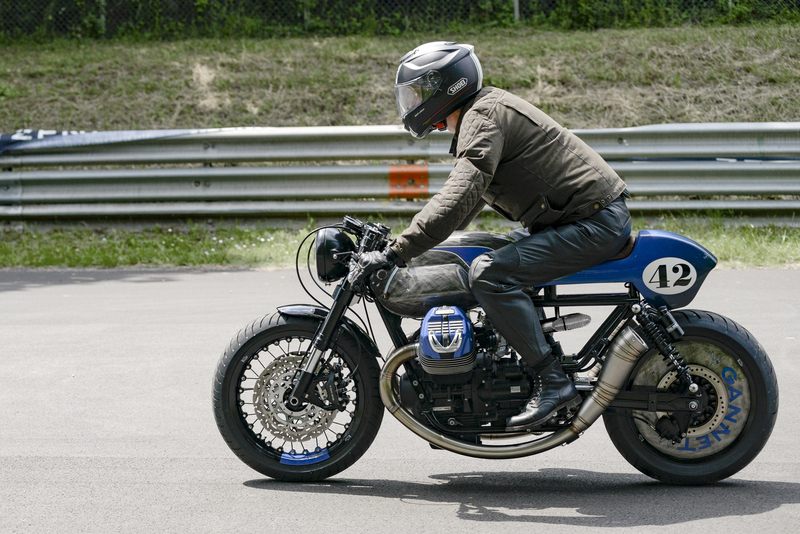 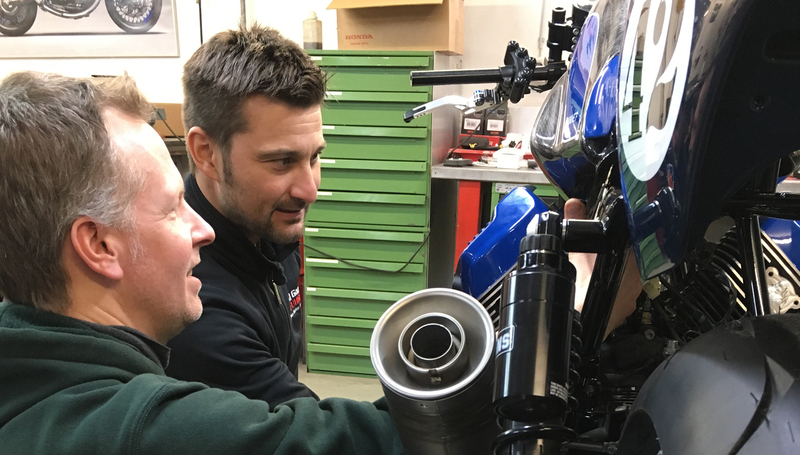 The wheel is supported by two Öhlins Blackline rear shocks.Although the bike is from 2016, we went “back to the roots” and provided it with artificial respiration help by two Keihin carburetors. 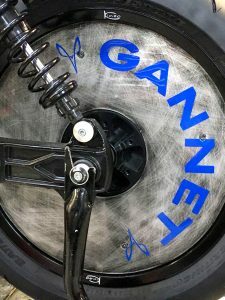 These will give the bike the necessary boost for the sprint races and give the conversion a flair of nostalgia.The transmitter wheel was adapted with the according different gearing. 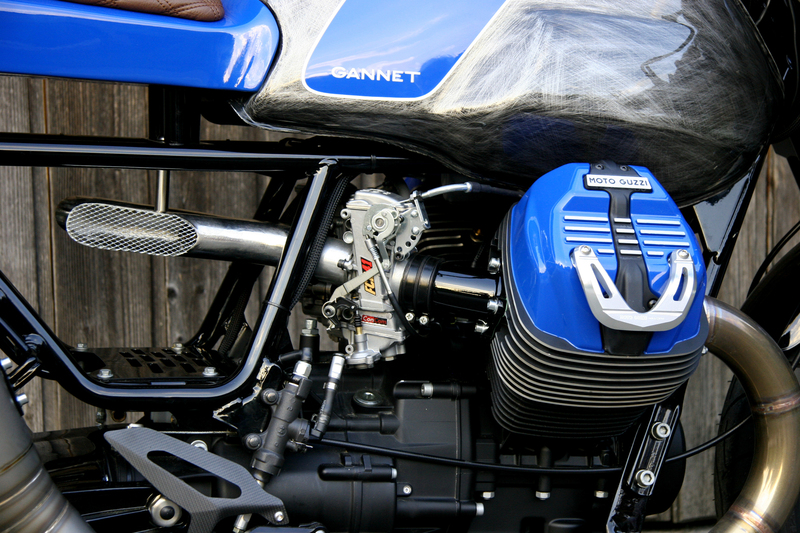 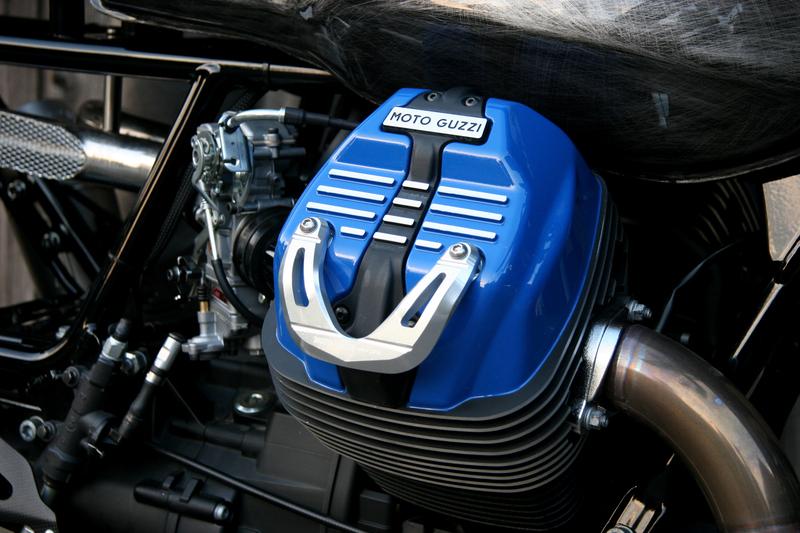 The flanges were specially made as well as the racing inspired air intake tubes. The pronounced round sweep of the exhaust pipe design gives a strong visual impact and enhances the fast forward dynamic of the bike even at a stand still. 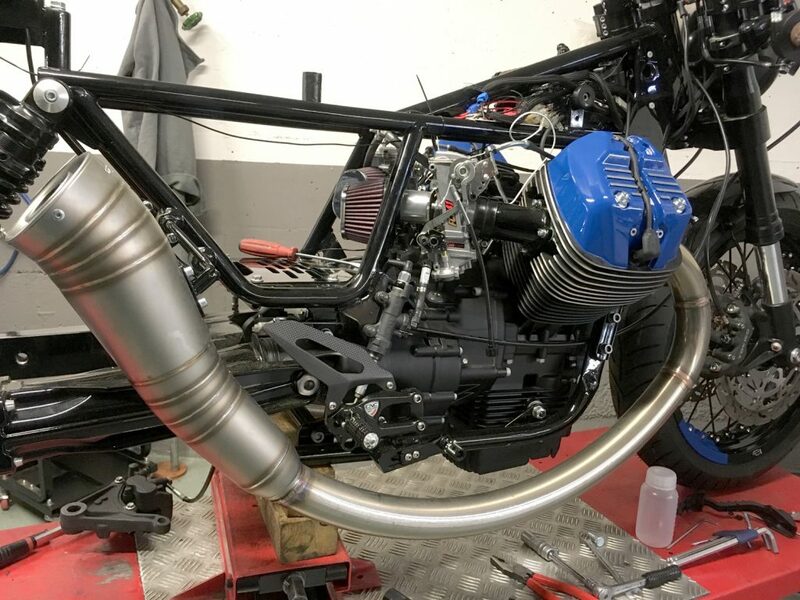 The twin pipes were bent and welded and smoothly blend into two Leo Vince GP Pro trumpets, which make already clear from a distance that there is a two cylinder approaching.